Well… Blaire officially started walking a week fews ago and there’s just no keeping her still these days. She is still loving all of her 9 and 10 month favorites, and we’ve added these in to the mix, as well. These days, she really loves books (especially if they have fun textures inside) and toys that sing. 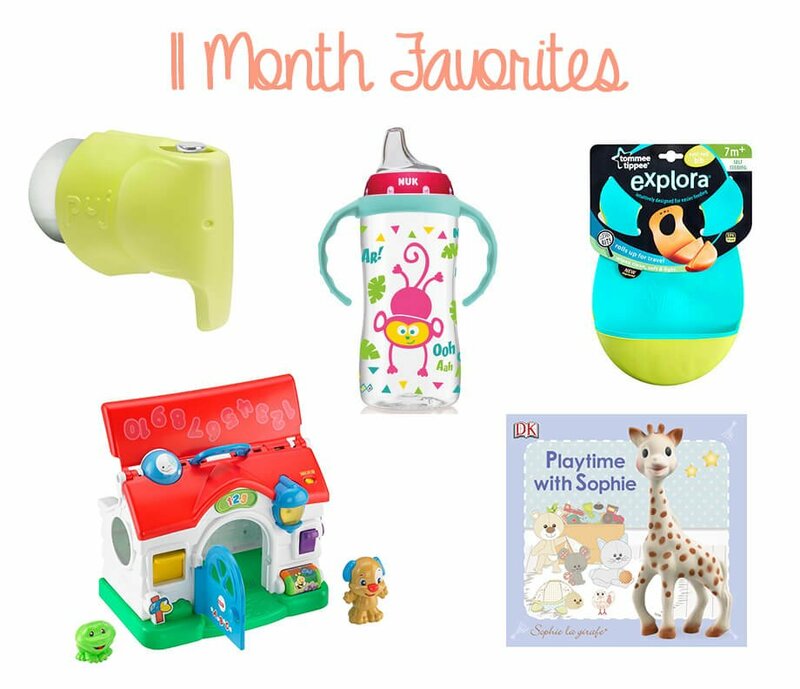 Below are our 11 month must-haves. Bath Spout Cover: We’ve officially moved Blaire out of our kitchen sink and in to the bathtub. This spout cover takes away the anxiety I have over Blaire hitting her head on the spout. And it’s so cute! Puppy’s Home: This little toy plays lots of songs… songs that will forever be stuck in your head. But, Blaire loves it and enjoys putting things in through the roof, and then taking them back out. Bibs: These bibs are great! They catch everything, and are only $6.99 for the both of them. Sippy Cup: This sippy cup is our go-to. She drinks her water out of it, and her formula throughout the day. The handles are removable, so she will be able to use it for awhile. Sophie Book: This book is one of Blaire’s favorites! Each of the pages has a different texture so it keeps her entertained on the way to daycare and back every day. The page with the bubbles on it is her favorite! We use the same bibs!